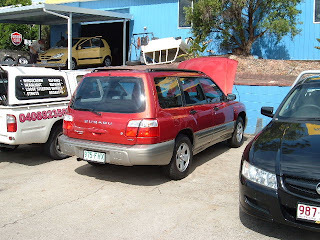 Today we bought my car, a Subaru Forester 4WD automatic from 2000 with 85,000kms for the on-road price of $14,000...about Eu7,000. Only one owner who was a doctor, it was regularly serviced. It is subject to a RAC inspection which hopefully won't bring out any defects. You see lots of Subaru's here on the road, its a decent car which will hopefully keep its value for a few years. Hoi Inge en Dave, Grappig,wij hebben ook een andere auto gekocht. Een Renault Scenic. Ook één uit 2000 met een kilometerstand van ongeveer 80.000 km.